to fi ght for restoring democracy, human rights, establishing a genuine federal union and dismantling the dictatorship in Myanmar alongside other democratic and ethnic nationality forces. 2006, to serve for a three-year executive term. 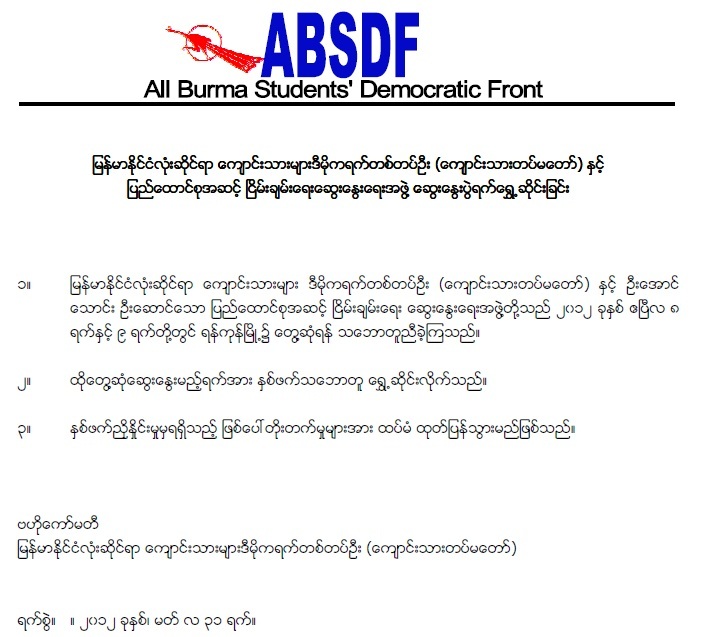 The ABSDF is a student army that formed after the 1988 uprisings. Their objective is to fight for democracy and human rights in Myanmar alongside other democratic and ethnic nationality forces. They have 7 camps along the Myanmar-Thailand border, 3 camps along the Myanmar-India border and 3 camps on the Myanmar-China border. The ABSDF also has foreign branches in the US and Australia. 1 17/01/2012 Mae Sot, Thailand Vice-chairman Myo Win Aung Thaung ABSDF presented a ‘peace talk’ paper that defined their position. They accepted the government’s peace offer as constructive first step and ready to talk if they are allocated equal rights. The government sent a formal letter offering to engage in peace talks with the ABSDF on Jan.10, 2012. 2 09/02/2012 Mae Sot, Thailand Vice-chairman Myo Win Major Saw Khin Soe (representing Aung Thaung) No agreement was made, but both sides agreed to meet again for further negotiations. 4 18-24/12/2012 Naypyidaw and MPC Yangon Chairman Than Khe, Secretary Sonny Mahindra and 7 others Aung Min and MPC members An ABSDF delegation organized a study trip to better understand the government’s development and implementation of the peace process in the country. During the trip, they consulted with 88 Generation Student Group leaders, SNLD leader Khun Htun Oo and other ethnic political party leaders. The ABSDF delegation also met with their respective families. 5 21/05/2013 MPC ABSDF U Aung Min Ko Kyaw Ko and Ko Sonny Mahindra led the ABSDF met with U Aung Min at MPC on May 21. ABSDF said "peace and national reconcialiation is important and priority to implement". they discussed about continuing peace talks. Representatives from northern region did not turn up as the govt did not provide assistance or security. 7 05/08/2013 Yangon-MPC ABSDF- total 34- 24 from CEC, 5 from northern and 5 from India UPWC/ MPC 4 agreement, 1. starting from august 5 to ceasefire, 2. ABSDF members must be free going around without weapons 3. Liasions office open at Myawaddy and other places etc. 4. Union level discussion will be on 10 August for official representative. 12 points proposed by ABSDF. 11 20/11/2013 Nay Pyi Taw ABSDF UPWC- Aung Min UPWC and ABSDF meets in Naypyitaw for the ceasefire terms during the union level talks. The government requested for the ABSDF to surrender their arms and set up a political party. During the ABSDF delegation study trip in December, 2012, they met with NLD patron Tin Oo Ethnic Shan, Arakan and Mon leaders from the United Nationalities Alliance and 88 Generation Students group.